Comments: Finished Chapter Eight, started Chapter Nine. Betsy is doing some scouting because she’s the only one small enough to fit through an opening. Posted on November 7, 2017 by Lawrence Watt-Evans in Progress Reports. 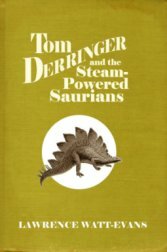 Work in Progress: Tom Derringer and the Steam-Powered Saurians. Pages added, 11/3/17: 5, but it’s complicated. Comments: I skipped a couple of reports again. Since my last post here I realized I was getting off-track, threw out ten pages, and worked my way forward again. I was on page 80, then back on page 70, reworked some of the cut material and added a little new stuff to get to page 75, and then tonight I wrote five new pages. Tom and his companions have encountered something mysterious, and been spotted by an as-yet-unidentified person. Posted on November 4, 2017 by Lawrence Watt-Evans in Progress Reports.